Long overdue, and presenting a near impossible task, here begins a list of all known television appearances by Jackie Lee. According to a 1967 press release, The Raindrops alone had regular appearances on ten BBC radio series and eleven TV series. Six-Five Special, BBC TV, 29th November 1958. The Raindrops appeared alongside Ronnie Carroll, the Eric Delaney Band, Don Lang, Lita Roza, and Sheila Southern. Drumbeat, BBC TV, 25th April 1959. The Raindrops' first appearance of many on Drumbeat, a show which significantly raised their profile. Hosted by Gus Goodwin and also featuring Adam Faith, the John Barry Seven, the Millermen and all the regulars. The Raindrops were featured along with Joan Baxter, Ronnie Aldrich and others. Drumbeat, BBC TV, 2nd May 1959. The Raindrops, plus Adam Faith, Vince Eager, Billy Fury, etc. Drumbeat, BBC TV, 9th May 1959. The Raindrops, Cliff Richard & The Drifters (Shadows), Adam Faith, Vince Eager, John Barry, etc. The Raindrops plus Ronnie Aldrich, Ray Pilgrim, Cliff Richard & The Drifters. Star Show, BBC Radio, circa 1960-1962. The Raindrops were featured regularly on this show, produced by the Beeb's transcription service for broadcast overseas. Gert & Daisy, Associated-Rediffusion (ITV) TV, September 1959. The Raindrops appeared in one episode of the short-lived comedy series by the Waters sisters, directed by Milo Lewis. This footage is known to still exist. Hosted by David Jacobs, Jackie performed There's no-one in the whole wide world, and the Raindrops provided backing vocals for other artists on the show. This may well have been The Beatles' introduction to the song which they performed in concert later that year. Other artists were Johnny Angel, The Brook Brothers, Ronnie Carroll, Karl Denver, Donna Douglas, Frank Ifield, Kenny Lynch, Brad Newman, Rikki Price, Doug Sheldon, Robb Storme. The musical director was Harry Rabinowitz. Tommy Steele's show with special guests The Raindrops. The Raindrops, Adam Faith & The Roulettes, Houston Wells and others. The Raindrops with The Tornados and Gerry & The Pacemakers. The Raindrops plus Susan Maughan and Acker Bilk. The Raindrops, Patsy Ann Noble and some pop combo called The Beatles. The Raindrops, Jet Harris & Tony Meehan, Julie Grant. Hosted by Jim Dale and featuring Jackie Lee, The Searchers, Russ Conway, Billy Walker, The Four Pennies, Kenny Lynch, Anita Harris and Doug Kennedy. No relation to the popular TV programme. Jackie recorded new versions of her own material and, as was standard practice, covers of a couple of recent hits. The material was exported for broadcast overseas. Jackie performs her Emma Rede song Just like a man while holding what looks like a daffodil. Other guests on this show include Episode Six and The Smoke. 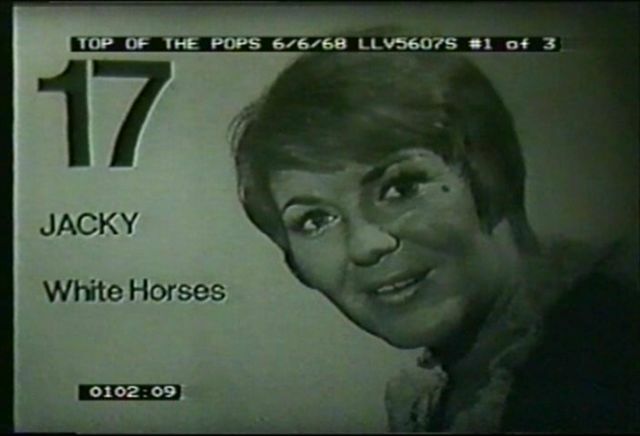 Jackie performed White horses in two shows, both of which are lost. Jackie performed on Russ Conway's afternoon radio show in 1970. Jackie performed Rupert on the fondly-remembered gameshow hosted by Bob Monkhouse. Click on the logo above. Jackie appeared on a number of British TV programmes to promote Rupert. Possibilities include Lift Off With Ayshea, Crackerjack, Magpie and Blue Peter. Can anyone out there confirm any of these? Jackie made a guest appearance when Vince Hill was honoured with the red book (series 7, programme 171).